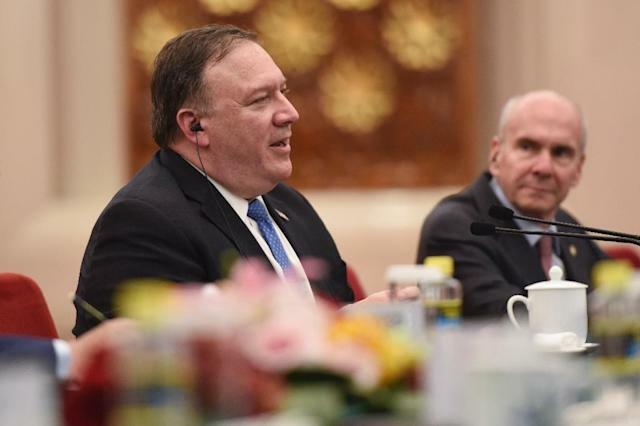 Washington (AFP) - US Secretary of State Mike Pompeo said Monday he expects to meet with Kim Jong Un soon to flesh out details of the North Korean leader's promise of nuclear disarmament. As Washington's top diplomat, Pompeo laid much of the groundwork for last week's historic summit between Kim and President Donald Trump, and is now planning follow-up talks. Addressing business leaders at the Detroit Economic Club, Pompeo said it was "hard to know" if and when the two heads of state would hold another summit to finalize a deal. But more discreet diplomacy is continuing. "There's a lot of work between here and there. My team is already doing it. I'll likely travel back before too terribly long," Pompeo said. "We still need to flesh out all the things that underlay the commitments that were made that day in Singapore." Before the Singapore summit, Pompeo had met twice with Kim Jong Un in Pyongyang, once secretly in his previous post as director of the CIA. Many experts and Trump critics have suggested Kim came away from Singapore having won cheap US concessions in exchange for a vague promise of future disarmament. But Pompeo insisted that Kim is serious. "He has made very clear his commitment to fully denuclearize his country," Pompeo said. "That's everything, right? it's not just the weapon systems, it's everything. "In return for that, the president has committed to making sure that we alter the armistice agreement to provide the security assurances that Chairman Kim needs." Separately, Pompeo's office said, the secretary spoke to his South Korean counterpart Foreign Minister Kang Kyung-wha "to discuss next steps in the wake of the historic Singapore summit." Earlier, Kang had said that sanctions against North Korea could be eased as soon as it takes "substantive steps towards denuclearization," seemingly setting the bar lower than Washington. But Pompeo's office said both allies remain "committed to the goal of complete, verifiable, and irreversible denuclearization." According to the Russian foreign ministry, Pompeo also spoke about North Korea by telephone with Foreign Minister Sergei Lavrov.